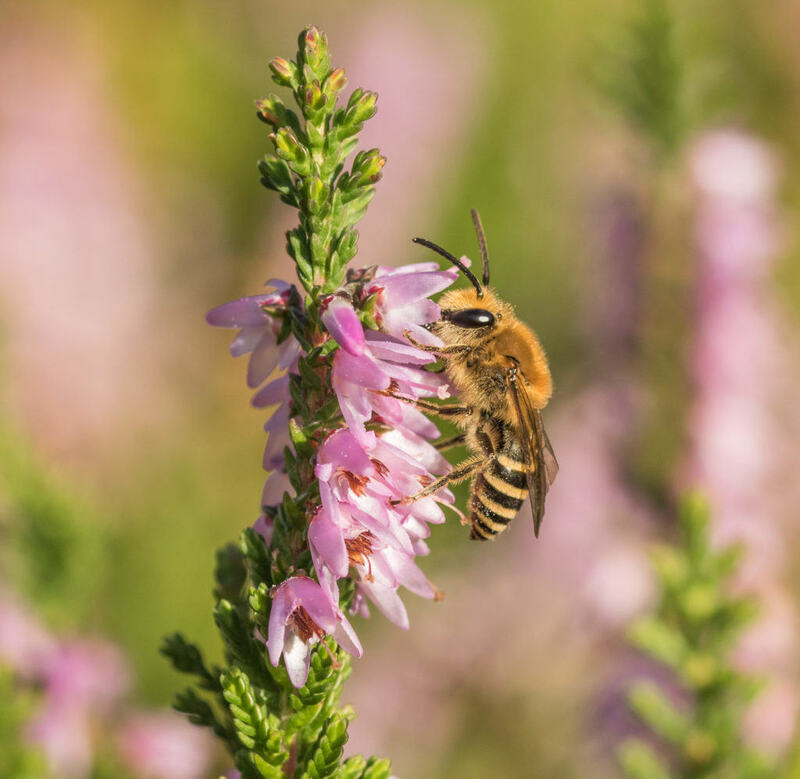 The debate surrounding this unassuming shrub seems a particularly divided subject amongst the general public, gardeners and conservation bodies alike. Does ivy kill trees? Should it be left or removed? Is it an invasive species in need of control? 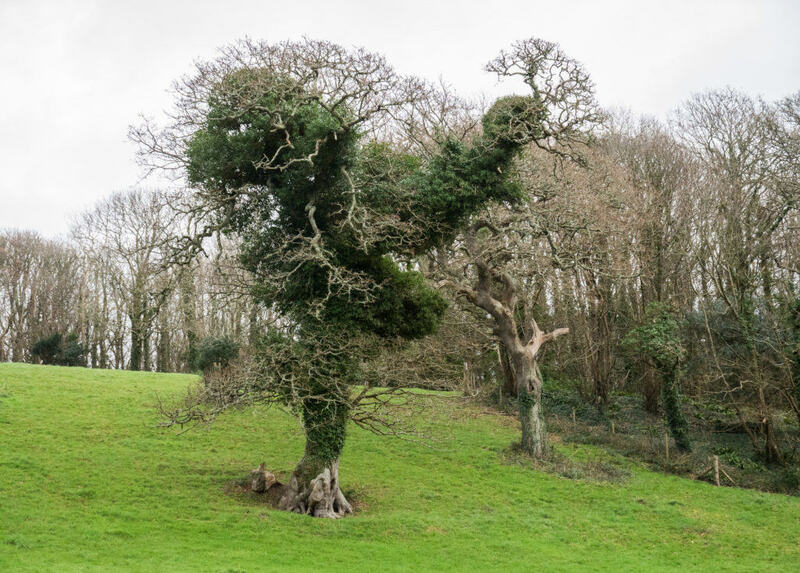 I was prompted to write a blog on the good old Ivy debate after coming across the slashed exhibits of many an ivy vigilante in the last week: from gardens to woodlands, I’ve noticed a surprising number of trees where ivy stems at their bases have had large chunks removed or simply been clean cut. This frustrates me no end, as I am a firm advocate of the beleaguered plant, and I shall explain why. Let’s set a few details down straight away: Ivy does not kill trees, and it is not a parasitic plant. Trees that succumb to ivy infestation are usually weak and under stress, and so are on their way out anyway. Healthy trees have a sufficient crown that inhibits the required photosynthesis that’s allow ivy’s vigorous growth. And so if you see a tree utterly laden with the green stuff, it’s very likely it not be in a happy state of affairs, irrespective of the ivy. This Oak would have lost health due to external factors, allowing the ivy to take over the tree in a pretty fashionable style! Furthermore, even where ivy does compete for light in unhealthy trees it supersedes, it does not directly tap in to a tree’s lifeblood of resources as do parasites like Misteltoe; the stringy roots you see sprouting from ivy are merely adaptations to provide support and facilitate its climbing nature. Ivy’s ‘real’ roots are anchored in the ground at the base of a tree. Anyway – in addition to not being the devilish killer it may seem, the wildlife value of this evergreen plant is enormous. The tangle of branches entwining trees and the dense mass of bushy leafage provides perfect sheltered spots in which birds can construct their nests, and the plentitude of nooks and crannies are important day-roost sites for many species of bats. Come autumn, Ivy bursts into a mass of sweet-scented flowers, which acts as a veritable mecca for insects. Flowering as late as November, it is a very important source of nectar and pollen for bumblebees, butterflies, hoverflies, wasps and countless other insect species. 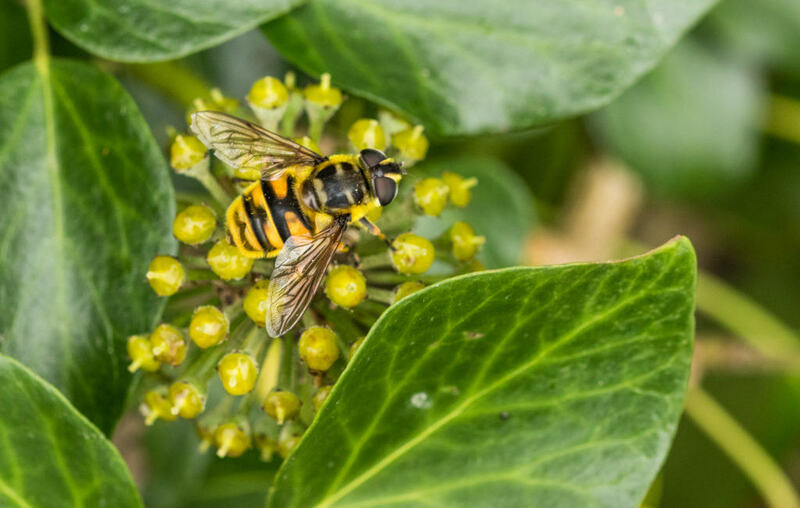 There is even a recent colonist named after its dependence on this late resource: the Ivy Mining Bee, which is active late in the autumn and subsists almost exclusively on the rich provision from Ivy. 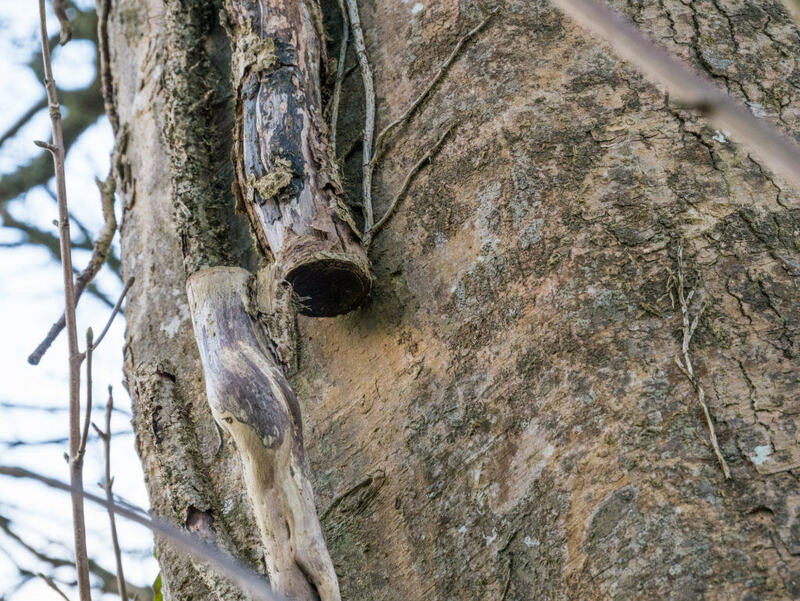 Over winter, the same tangled mess that allowed nesting spots for birds provides invaluable cover for insects, small mammals and birds escaping inclement conditions. By January, most mature Ivy plants will have set seed thanks to the pollinators it attracted in the autumn. 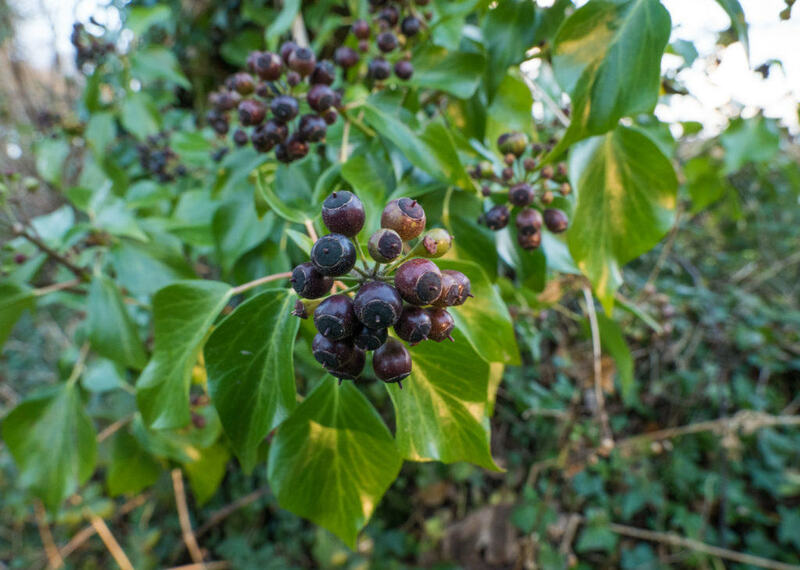 These large, shiny-black fruits become an important food source for countless residents and winter visitors: woodpigeons, thrushes, blackcaps and starlings to name a few of the species that enjoy gorging themselves on the bounty. As a final plug for its habitat provision, there are beetles that bore into its stem, insects which feed on the tough leaf cuticles, and many spiders that construct their webs amongst the herbage to ensnare victims. So returning to the burning issue: why do so many people seemingly despise the plant? I suppose it all boils down to context: whilst in woodlands and hedgerows it is perfectly fine for ivy to run rife in its natural state (in my opinion! ), in parks and gardens it may be much less desirable. I don’t have a problem with gardeners controlling ivy where it may be considered a weed; those who like tidy gardens keeping it at bay through cutting (I’ll leave ‘tidy’ gardening to another post!). The big problem arises when people who are used to controlling ivy in these contexts develop a sort of vendetta against the plant, and extend their gardening ethic to the surrounding countryside. The bad reputation it acquires from its urban context results in a tainted picture of this species when people see it seemingly ‘smothering’ trees in woodlands. It must be controlled! I must save the tree from premature death! Out come the saws and secateurs and the innocent stem is hacked in two: the dead skeleton of patterned roots clinging on like a spectre for weeks to come. So, if you are an avid Ivy adversary, I hope I have convinced you to think twice next time you’re faced with the creeping stem of this unassuming plant. Please don’t succumb to the irresistible urge to severe the trunk in blatant ignorance of your effect: you’re not saving the tree. The only thing you’re cutting is the multitude of benefits this plant provides. Previous ArticleWill the human race learn? I am a young wildlife enthusiast and aspiring photographer, with a love for the natural world. I have lived half my life on a small island off the coast of Wales, called Bardsey, where I gained a real appreciation and interest in the wildlife and birds that inhabit its shores. I hope to pursue a career in conservation and the environment, with a particular emphasis on birds. I am currently studying a degree in Conservation Biology with the University of Exeter, based in the superb Tremough Campus in Cornwall.